A subpoena is a paper used in a court or administrative proceeding to command a nonparty to appear and testify, and in the case of a subpoena duces tecum, to produce certain items or documents for use in the case (sub poena = under punishment, and duces tecum = bring with you). Threat of punishment makes a subpoena a form of “compulsory process” by which the government exercises jurisdiction over you and your property. A subpoena is not a summons; by contrast, a summons orders you to appear in court as a party to defend claims made against you. Failure to appear in response to a summons can result in entry of default and default judgment. Failure to appear in response to a subpoena can result in penalties for contempt of court. So, you ignore a properly drawn and served subpoena at your peril, and the remedy of the requesting party will be to have you ordered to appear in court and show why you should not be held in contempt. The court or administrative tribunal in which the subpoena is issued will very likely be jealous of its authority in this regard. Fines and even incarceration are possible sanctions. When served with a subpoena duces tecum, read it carefully, noting the date, time and place for appearance, and the material you have been ordered to produce. Then call your lawyer and send her a copy of the subpoena for review and appropriate comment. It may be that local custom allows you to send copies of the documents to be produced without the need for your appearance. If so, you will probably have to sign a certification which will enable the use of the records as evidence without formal foundational testimony. If your testimony will be required at the court proceeding along with the subpoenaed documents, bring the originals. For certain evidentiary purposes, only originals will do. Ask your lawyer about local rules that apply to documents maintained in digital format – it may be that you can have the costs of production paid by the requesting party. Remember, when served with a subpoena or subpoena duces tecum, you need to act with the advice of counsel. Ask your lawyer if the subpoena seeks your expert opinion testimony without lawfully required compensation. If the subpoena is defective or illegally intrusive or burdensome, your lawyer may move the issuing authority for an order to quash the subpoena, which is to say, a directive that the subpoena is null and void and of no legal effect. Most times, a subpoena duces tecum merely requires the custodian of records to swear that documents produced were prepared and maintained in the ordinary course of business, and that entries in the records were made at or about the dates or times noted. Other times, the records are an afterthought, and witness testimony is the main event. At all times, a subpoena duces tecum is a serious matter, which if ignored or mishandled, can cost the careless recipient his money, his liberty or both. Temperature is frequently used to gauge the condition of motors and power transmission equipment. In this Tip, we discuss the effect of heat on flexible drive belts and temperature limits for them. Drive belts are an integral component on many types of machines. Despite the critical role they play in machine operation, V type drive belts tend to out-of-sight and out-of-mind until they fail. In most installations, belt temperature largely influences the life installed V belts. Thermogram shows overheating V belt. Note castoff in control photo. Images courtesy Skip Handlin. Temperature limits for mechanical equipment is one of the many topics covered in the Infraspection Institute Level II Certified Infrared Thermographer® training course. Classes are held regularly throughout the year and are also available through our web-based Distance Learning Program. For more information, please call 609-239-4788 or visit www.infraspection.com. In his commentary, ‘The 35 Undeniable Truths’, Rush Limbaugh states, “Words mean things.” This is especially true in thermography when it comes to one’s certification. Equipment calibration can have a significant impact on the accuracy of infrared temperature measurement. In this Tip we discuss a simple technique for checking the accuracy of imaging and non-imaging radiometers. Infrared radiometers must be within calibration in order to accurately measure temperatures. Traditionally, thermographers periodically send their equipment to the manufacturer for calibration. For some, this process can take several weeks and can be rather expensive. As an alternative, savvy thermographers can check the calibration of their instrument quickly and easily using some commonly available items. In order to check infrared radiometer calibration, you will need at least two targets each with a known temperature and emittance. A simple solution is to use a container of ice water and a container of boiling water with a coupon of Scotch PVC electrical tape affixed to the container’s exterior surface. The size of both targets must exceed the spot measurement size of the instrument being calibrated. Container temperatures may be ascertained with a thermometer, thermocouple or contact radiometer. Turn radiometer on and allow it to stabilize to room temperature. Using subject radiometer, measure temperature of target. For ice water, measure temperature of ice cubes. For hot water container, measure tape coupon. A heated blackbody simulator can be used to check instrument calibration at higher temperatures. Because radiometer calibration is not user-adjustable, it will be necessary to return it to the manufacturer should you find your instrument is out of spec. Verifying infrared equipment calibration is specifically covered within Infraspection Institute’s online short course, How to Check Infrared Equipment Calibration. Available 24 hours per day, this 27 minute course focuses on the simple, yet effective techniques for calibrating infrared equipment. The techniques demonstrated are complaint with accepted industry practice and ISO standards. For more information or to register, please visit: http://www.successiries.com/SuccessIRies_108.html. Infrared thermography is a proven technology for detecting defects in electrical circuits that are under load. Thermal imaging can also be used to detect defective lightning arrestors that are leaking current to ground. Lightning arrestors are a common feature in electrical distribution systems and are used to guard against voltage surges associated with lightning strikes on power or communications lines. Installed at strategic locations, lightning arrestors act like a safety valves to provide a short circuit path that carries excess voltage to ground during a lightning strike. Lightning arrestors are connected between a conductor and ground. In order to prevent a ground fault, lightning arrestors are engineered so that normal line voltage will not pass through the arrestor under normal conditions. While some lightning arrestors employ a simple spark gap, others consist of porcelain tubes that are filled with semi-conductive discs made of silicon carbide or zinc oxide. During a lightning strike, the resistance of the spark gap or oxide plates is overcome and excess energy flows to ground. If a lightning strike is sufficiently strong, lightning arrestors may be permanently damaged and begin to conduct electricity to ground full time. When this happens, the body of the arrestors will heat up allowing them to be detected with a thermal imager. The images below show two examples of defective arrestors. Infrared inspections of lightning arrestors are primarily qualitative in nature. As such, thermographers should compare similar arrestors to one another and note any that are inexplicably warm. Properly functioning lightning arrestors should be uniform in temperature and close to ambient air temperature if they have not undergone recent solar loading. Individual arrestors should not have any pronounced hot spots across them. Working early in the morning, on cloudy days or at night will help to eliminate solar loading which can hide defective arrestors. When performing your inspection, don’t forget to check grounding connections for hot spots as well. Infrared inspection of power distribution systems is one of the many topics covered in the Level I Infraspection Institute Certified Infrared Thermographer® training course. For information on thermographer training including course locations and dates, visit us online at www.infraspection.com or call us at 609-239-4788. You can’t believe everything you hear. This can be especially true when it comes to performing infrared inspections on flat roofs that contain closed cell foam insulation. Closed cell foam generically describes several insulation materials commonly found in low slope or flat roofs. Typical materials include urethane foam, isocyanurate foam and, in some cases, cellular glass. Closed cell foam insulations typically offer good R value, are dimensionally stable, and can be used with a wide variety of roofing materials. Another characteristic of closed cell foam insulations is that they are water resistant. This characteristic, however, only applies to short term exposure to water. When installed in a roofing system and exposed to water for extended periods of time, the cells tend to break down permitting the insulation to become quite absorbent. When this occurs, foam insulation can absorb large quantities of moisture and will exhibit the type of thermal patterns typically associated with absorbent insulations. Over the years, many have claimed that infrared inspections of closed cell foam roofs are ineffective due to foam’s low absorbency. The thermal image below clearly shows the extent of water damage in a roof constructed with foam insulation. Light gray areas indicate extent of wet foam insulation in a built-up roof. Note the solid thermal pattern typical of absorbent insulation. Initially, thermal patterns associated with latent moisture in roofs containing foam insulation will exhibit ‘picture frame’ signatures. These thermal patterns are due to water collecting at the perimeter of individual boards. As time progresses and the foam loses its water resistance, insulation boards will begin to exhibit the same type of thermal signatures exhibited by wet, absorbent insulations such as wood or glass fiber. Infrared inspections of flat roofs is one of the many applications covered in the Infraspection Institute Level I Certified Infrared Thermographer® training course. For course schedules or to obtain a copy of the Standard for Infrared Inspection of Insulated Roofs, visit Infraspection Institute online or call us at 609-239-4788. Many who live in cold climates are in the habit of allowing their automobile to warm up before driving. For accurate temperature measurement, one should allow sufficient time for a radiometer to equalize with ambient temperature. When performing non-contact temperature measurements, many thermographers correct for error sources due to emissivity, reflectivity and transmissivity. One error source that is often ignored is the temperature of the radiometer itself. Depending upon design, radiometer operating temperature can significantly affect measurement accuracy. Radiometers are calibrated under controlled laboratory conditions at stable ambient temperatures. To help ensure measurement accuracy, quality radiometers are constructed with internal temperature sensors. These sensors allow the radiometer’s firmware to correct for operation at different ambient temperatures. When performing non-contact temperature measurements, radiometers should always be allowed to stabilize with ambient air temperature. Additionally, one should ensure that the radiometer’s lens is clean and free of condensation. That’s the headline that has appeared in the last few weeks in not a few publications across the USA. So, what does it mean and is it really true? SEO stands for Search Engine Optimization and if there is anyone in the business world who doesn’t know what that is…then SEO really isdead. SEO, simply stated, is the working with a website to manipulate a number of key factors that Google and other Search Engines look at to determine whether to include your website on the results page when someone does a search. For a long time those factors included but were not limited to keywords, links to your website, the size font you used on the page for headlines, the description of your webpage and the title of your webpage. Although there is still much talk about metatag keywords, it should be noted that Google abandoned that datum a few years ago. If there was any doubt about SEO being still alive, Google certainly made it difficult on websites with their release of Panda (February 2011) and, recently, Penguin (April 24, 2012). Panda and Penguin are code names of the update of the Google algorithm that evaluates a website for inclusion in the search engine result pages. The most recent modification to Panda was July 28, 2012. So, what did Panda and Penguin do? The most interesting change with Panda is that an entire website is rated and ranked as opposed to a single webpage. This means that if Google considers a website of low quality, then all the individual changes to single pages won’t do much to promote your website. 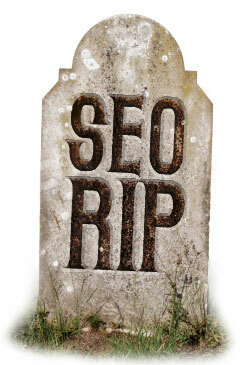 So, if the above is YOUR definition of SEO, then, SEO is dead. However, if you have been paying attention to what’s going on in cyberspace than you have perhaps heard about Twitter, FaceBook, Google+. You have probably heard about blogs and YouTube. All of these platforms are known collectively as Social Media. This is where you need to look now if you are interested in SEO. What do all of the above sites have in common? People. People talking to People. People giving their opinions about a number of topics including websites. This is where SEO is right now. What does it take to get people to talk about your website? There are a number of actions that you can take but one above all stands out: content. Really good content that provides value to people and then….well, people talk about things that provide value to them. Consequently, the winning combination is Good Content that is promoted in Social Media that gets the attention of Google and other search engines. Then, your website will rank well on the results page. For the company that does this, SEO is very much alive! Infrared inspection of buildings is one of the many topics covered in the Infraspection Institute Level I Certified Infrared Thermographer® training course. For more information or to register for a course, visit Infraspection Institute or call us at 609-239-4788. Post processing of thermal images is a common practice for many thermographers. While image processing may provide a measure of convenience for some, it can have significant drawbacks. For many thermal imagers, infrared images can be stored in 12 bit format. Saving thermal images in 12 bit format allows thermal images to be recalled at any time and post processed for level, gain and color palette. For imaging radiometers, temperature measurement settings such as emittance may also be changed. Post processing may take place within the imager or through a separate personal computer using the manufacturer’s proprietary software. Over time, many thermographers have adopted a policy of quickly recording imagery in the field and then returning to the comfort of their office to further process their imagery. Although post processing affords the thermographer a variety of options for image analysis, one should be aware that post processing can be time consuming. Spending as little as five minutes processing imagery can result in a substantial increase in report preparation time. In addition to wasted time, post processing may invalidate imagery as legal evidence. Not unlike digital photography, thermal images that have been post processed are creations and not originals. Should a thermographer’s report be introduced in a claim, a competent opponent will likely question if the imagery is original. In such situations, a thermographer must be able to affirm that his/her report does not contain processed imagery. In light of the above, we recommend that thermographers store images exactly the way they will appear in their report and endeavor to avoid post processing altogether. Image recording and reporting are two of the many topics covered in all Infraspection Institute Certified Infrared Thermographer® training courses. For information on thermographer training and certification, visit us online at www.infraspection.com or call us at 609-239-4788. To everything there is a season. The same is true for infrared inspection routes within facilities where equipment or systems are operated seasonally. Traditionally, many facilities perform infrared inspections on an annual basis. While this approach may detect deficiencies within operating systems, systems not under load due to seasonal or operational conditions cannot be effectively inspected. Be certain to perform a follow up inspection for all detected exceptions once necessary repairs have been completed. As always, remember to observe all necessary safety precautions before, and during the infrared inspection. The topic of route based infrared inspections and how to properly organize inspection routes are two of the many topics covered in the Infraspection Institute Level I Certified Infrared Thermographer® training course. For more information or to register for a course, visit Infraspection Institute or call us at 609-239-4788. For many facilities the beginning of autumn means that heating season is just around the corner. Infrared inspections can help point out the types of energy liabilities that can account for significant waste. With energy costs at an all time high, energy conservation is more important than ever. With companies looking for ways to contain costs, energy conservation makes sense. When properly conducted, infrared inspections can point out areas of thermal deficiencies or energy loss. When coupled with timely, effective repairs, considerable savings can be realized. When it comes to the above inspections, time is of the essence in order to maximize savings. Infrared inspections should be carried out as soon as possible. Waiting until the heating season is well under way often results in documenting opportunity lost rather than savings realized. Infrared inspection of building envelopes and thermal energy delivery systems are two of the many topics covered in the Infraspection Institute Level I Certified Infrared Thermographer® training course. This same information is also covered in our Distance Learning Level I Thermography course. For more information or to register for a course, visit Infraspection Institute or call us at 609-239-4788. Thermal imaging is widely used to detect evidence of excess energy loss in building envelopes. Under proper conditions thermal imaging may be used to detect excess energy loss through spandrel glass panels. Glass curtain walls are a common feature found on modern commercial buildings. 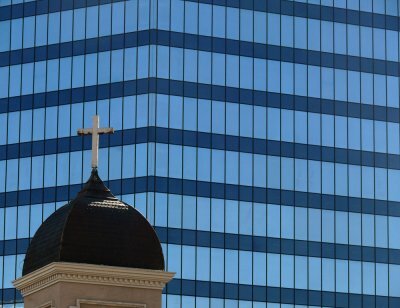 Opaque glass panels called spandrels are used to cover materials or prevent construction elements from being viewed from the exterior of the building. Examples of such areas include areas between floors, hung ceiling areas, knee-wall areas below vision lights, and sometimes even columns or partitions. Spandrel panels appear as dark horizontal bands on this high rise building. Depending upon building construction, spandrel glass may be installed as single-thickness panes, as part of insulating glass units, or as laminated glass. When installed as single pane units, spandrel panels are often insulated to prevent excess energy loss; however, construction details will vary between systems. Prior to the infrared inspection, ascertain building usage and construction. Be aware of HVAC settings and how they are likely to affect observed imagery. Spandrel glass panels can vary widely. Determine panel construction and characteristics prior to the inspection. When imaging from a building’s exterior, significant errors can be introduced by hot/cold reflections from nearby structures or the sky. Because spandrel glass often has a low emittance; detected exceptions are likely to have low temperature differentials. Infrared inspections of spandrel glass should be performed during evening hours with an inside/outside temperature differential of at least 10ºC. Exceptions associated with spandrel glass may appear as hot or cold depending upon building usage, imaging vantage point, and panel construction. As always, detected exceptions should be investigated for cause and appropriate corrective measures taken. Infrared inspection of building envelopes is one of the many topics covered in the Level I Infraspection Institute Certified Infrared Thermographer® training course. For information on thermographer training including course locations and dates, visit us online at Infraspection Institute or call us at 609-239-4788. When performing infrared inspections of framed buildings from the interior, thermographers often note that corners appear at a different temperature. With this Tip we explore the reasons for this condition and how to differentiate potential problems from normal conditions. Corners are a common construction detail found within building walls that utilize frame construction. Corners are typically constructed with vertical framing members that both support the framed wall and provide a nailing surface for interior paneling or drywall. Although details can vary, a typical corner has three vertical studs in close proximity to each other. More energy loss occurs at corners for two reasons: Studs are more conductive than insulation; and there is little or no space for insulation to be installed wherever corner framing studs are present. Because of this, it is normal to see greater energy loss at corners when compared to a properly insulated wall cavity. When performing an infrared inspection of framed walls from the interior of a building with cold outdoor temperatures, corners will typically appear cooler than insulated wall cavities. Observed thermal patterns will reverse should the same inspection scenario exist with warm outdoor temperatures. When thermographically inspecting corner details, it is normal to observe a straight vertical line from floor to ceiling. This vertical line should be confined to the corner itself and not extend onto the flat wall surfaces adjacent to the corner. Amorphous or geometric thermal patterns appearing within or adjacent to corners should be investigated for cause. Infrared inspection of building envelopes is one of the many applications covered in the Infraspection Institute Level I Certified Infrared Thermographer® training course. For course schedules or to obtain a copy of the Guideline for Performing Infrared Inspections of Building Envelopes and Insulated Roofs, visit Infraspection Institute online at www.infraspection.com or call us at 609-239-4788. When inspecting building envelopes for heat loss, thermographers tend to focus their imaging efforts on the sidewalls and roof. For some buildings, it is important to also thermographically inspect the underside of the building. In many parts of the United States a common building practice for commercial structures is to elevate the building on support columns and place an unheated parking garage directly below the first story. This practice exposes the underside of the first occupied level and its associated plumbing to the outside environment. In colder regions a common approach is to construct a suspended ceiling for the garage and to create a heated space between the underside of the first occupied floor and the garage ceiling so that water, waste, and sprinkler pipes do not freeze. To minimize heat loss, batts of glass fiber insulation are often laid directly on top of the ceiling tiles. When performed under proper conditions, an infrared inspection of the garage ceiling can quickly reveal thermal patterns caused by missing, misapplied, or damaged insulation. Areas exhibiting excess energy loss may then be visually inspected to ascertain cause. Infrared inspection of building envelopes is one of the many topics covered in the Infraspection Institute Level I Certified Infrared Thermographer® training course. For course information or to obtain a copy of the Standard for Infrared Inspection of Building Envelopes, visit Infraspection Institute online or call us at 609-239-4788. With the New Year upon us, many of us will follow the tradition of resolving to change or better ourselves. With this Tip, we offer suggestions for making job safety a priority. Lastly, resolve to make safety your number one priority each and every day. Safety is not a poster, a slogan, or a set of actions to be followed only when it is convenient. Rather, safety is way of life that affects not only you but those around you. Thermographer safety is one of the many topics covered in the Level I Infraspection Institute Certified Infrared Thermographer® training course. For information on thermographer training including course locations and dates, visit us online at www.infraspection.com or call us at 609-239-4788.